Newsletter Topics: The association between sleep hygiene and health related behaviors during adolescence. Suggestions on how to incorporate strategies to improve sleep and positively impact numerous other areas of life. 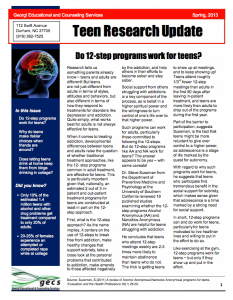 Spring 2013 (inaugural issue) Newsletter Topics: Do 12-step programs work for teens? Why do teens make riskier choices when their friends are around? Does letting teens drink at home keep them from binge drinking in college?